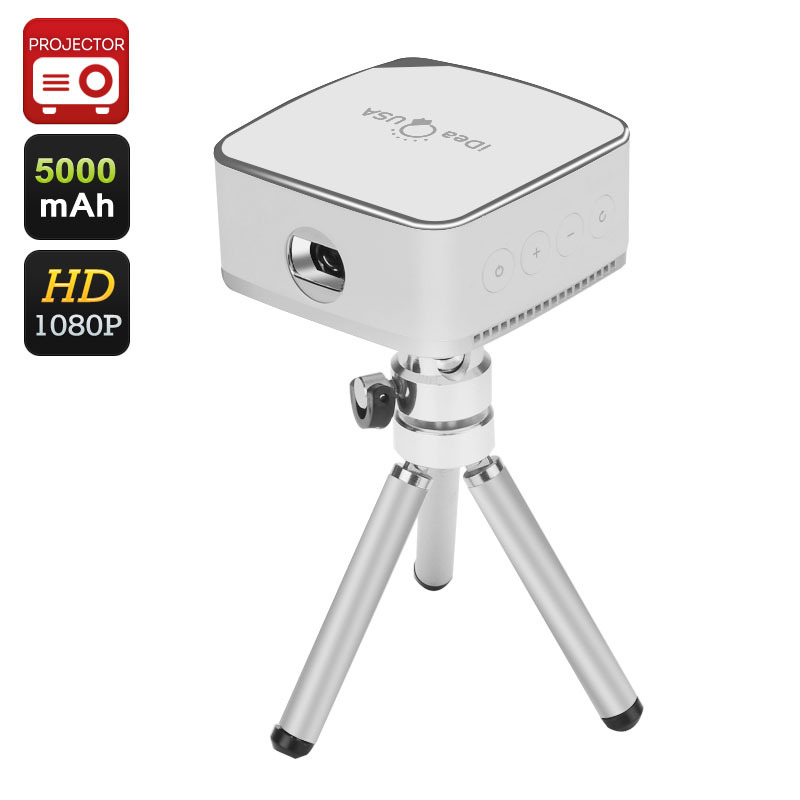 Successfully Added iDeaUSA Pico Mini Projector - 120 Inch Projection, 1080P, 5000mAh Battery, 80 Lumen, Pocket Size, iOS, Android, Mac, Win to your Shopping Cart. With the iDeaUSA Pico Mini Projector, you are always ready for a presentation, business meeting or movie time. Coming with a 120 inch display, 1080P resolution and a massive 5000mAh battery, the mini projector comes with great potential for your home or office. They say that seeing is believing, and it’s especially true when it comes to business meetings and presentations. Don’t make your potential partners and investors squint behind a tiny screen. Instead, let your ideas shine on the big 120 inch projected screen in HD. Thanks to the projector’s pocket size, it can be with you anywhere, ready to go at a moment’s notice. So, even if you have to be part of an impromptu presentation or an unscheduled meeting, your can quickly grab the projector and showcase your ideas in style. You can also take it outdoors for a fun movie night on the terrace or even set it up to play a movie on a camping trip. The mini projector is also a great way to enhance your home office if you are working remotely, helping you work more efficiently with tables, reports, spreadsheets and more. It can be used with DLNA and Airplay mirroring and is suitable for uses with Windowes, iOS, Android and Mac devices. The projector comes with a large 5000mAh battery, giving you up to 5 hours of play time - more than enough to do a presentation or even show the latest blockbuster at a party. With 80 lumens, you will get plenty of light and your images will always come out looking clear while with the 1080p resolution, even the smallest details are sure to be well presented on the screen. The iDeaUSA Pico Mini Projector comes with a 12 months warranty. Brought to you by the leader in electronic devices as well as wholesale mini DLP projectors.